On June 27, 2018, Governor Snyder signed into law Public Acts 247 and 248 of 2018. These Acts make changes to the Local Community Stabilization Authority Act (LCSA Act) and the calculation of personal property tax (PPT) reimbursements. Recently MLA partnered with WCMU, Central Michigan University's public radio station during their annual fund drive. The effort raised $12,000 for 119 area libraries to spend on children's books and early literacy material. We appreciate WCMU's outreach to include libraries in their fundraising efforts. The House and Senate Appropriations Committees have now passed fiscal year (FY) 2019 funding bills which provide level funding for Library Services and Technology Act (LSTA) and Innovative Approaches to Literacy (IAL). One of the best ways to ensure full funding is to express our thanks to the elected leaders who have supported libraries. Thank you to U.S. Rep. Moolenaar, who serves on the House Labor-HHS-Education Subcommittee of the Appropriations Committee for supporting libraries. Please take a moment to thank Rep. Moolenaar for his support of libraries with a call, tweet, letter, or letter to the editor. You can reach his congressional office by visiting this website. The FY 2019 funding bills now head to the full House and Senate. Read more at ALA's District Dispatch. If Dems See Big Wins, Will We See a Busy Lame Duck? In times of political change, lame duck session in the Legislature would be seen as one last chance to complete an agenda, a last shot at getting things done. But a review by MIRS of bills introduced and passed in lame duck shows that turning a chamber, or even the governor's chair, doesn't necessarily result in a high productivity lame duck session. The last time there was significant turnover in Michigan was 2010, when Rick SNYDER took over the governor's seat from Jennifer GRANHOLM and Republicans wrestled control of the House away from the Dems, a pretty mild lame duck session followed. That year, 105 bills were introduced in lame duck, five of which were eventually passed. Overall, lawmakers moved 175 bills to the governor after the election, which she signed. But remember, the GOP controlled the Senate, and could have put an end to any last minute Democratic juggernaut in the Legislature. Compare that to last election year, when the Republicans had and would retain the trifecta, holding the governor's office and both chambers. In 2016, 214 bills and resolutions were introduced in lame duck, six of which got passed. Overall, the governor signed 249 bills passed by lawmakers after the election. In 2014, 337 bills and resolutions were introduced in lame duck, and 10 of those were passed. Overall, 217 bills were passed and signed after the election. Oddly, the busiest lame duck in the last 18 years was in 2008, when lawmakers introduced 297 bills after the election and adopted 44 of them. Overall productivity in lame duck was 286 bills. When Granholm took over from John ENGLER in 2002, there were 147 bills introduced after the election, and 15 of them were passed. Engler signed 152 bills from lame duck session. Former Lt. Gov. John CHERRY told MIRS today that the lack of last-minute rush then wasn't really surprising. Engler had been governor for 12 years, plenty of time to execute his agenda, and had the trifecta for the last four. "They had ample opportunity to do what they wanted to do. It is not like they were cut short. There really wasn't as much angst as you might assume that there would be," Cherry said. Cherry agreed most people would assume lame duck, during turnover, would be one last chance to complete they agenda. "It is not so much a function of legislators as it is outside groups who may see a change in control as bringing a stop to the implementation of their agenda. They would be pushing for legislative action in lame duck to make something they want happen," he said. An example, he said, was in 2002 when Granholm took over from Engler. There was a big push to raise the limits on charter schools. Charter advocates knew Granholm wouldn't sign such a bill, so they pressed hard for lawmakers to pull the bill on Engler's desk before he left office. Ultimately, they were unsuccessful. Randy RICHARDVILLE, who was Senate Majority Leader from 2011-2014, said it is not the number of bills that make lame duck count. "More important than the number of bills is the quality of the bills and the impact they may have on the state," he said. "Auto no-fault could be a significant thing to get done during this last shot, to get it done in a way that would be meaningful to people." Another important issue that might be addressed is returning the income tax to 3.9 percent, which Richardville said was a promise made during the Granholm years, that once the economy was back in good shape, the income tax would be returned to that level. Richardville said this year's lame duck will be "unprecedented" because of the amount of turnover that will occur in both House and Senate. Seventy percent of Senate seats will be occupied by newcomers next year. The House will see 40 percent turnover, due both to term limits and legislators giving up time in the House to seek all those open Senate seats. (See "At Least 40 Of House Will Turn Over During '18 Elections," 3/30/18). But Richardville, a Republican, doesn't think it's going to result in a "blue wave." "I don't think it is a wave. I think it's a ripple. But I think at the same time, the biggest wave I've seen was when the Republicans took back the governor's office and the House all about the same time and it didn't have anything to do with what was happening at the state," he said. He contends Democrats at the national level pushed too far to the left with Obamacare and sent independents "scurrying to the right." By contrast, "the Michigan legislature and governor have not scared people by going too far to the right too fast . . . I don't see people running away from the Michigan right, or running away from the Michigan leadership. I see more people saying, 'You know, they did a pretty good job.'" Cherry, a Democrat, has a different take. "My impression is that Democrats have done a pretty good job of recruiting candidates, so they've got good candidates in contested races and I think it's pretty clear there is more energy among Democrats than among Republicans. Republicans tend to be on the defensive right now," Cherry said. "Are you going to see a big change where the Democrats are going to have a 10-seat majority? No, that's not going to happen, but the chamber could change. It could switch, the House. And people tend to think it is the Democrats' to lose in the gubernatorial election right now. So I do think right now the momentum is on the Democratic side and that will continue through November. A lot could happen. That's the nature of politics. Particularly with President (Donald) TRUMP, every day seems to be an adventure. He was riding high on Monday, and here we are on Tuesday and he's back tracking. So who knows." Rick JOHNSON, a Republican who was Speaker of the House from 2001 to 2004, also doesn't see a blue wave coming. "I believe elections are typically won in May when candidates file for the different seats. If you have good candidates, House seats can be won against a candidate that might not be so good." 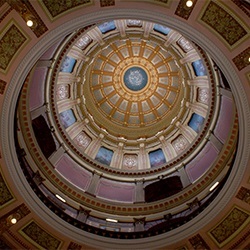 Despite its reputation as a time for legislative mischief, lame duck is a time when politics is out of the way and bills can get passed, Johnson said. "I loved lame duck. It was a time to get things done that had not been done in the prior year and a half," he said. "It's unfortunate that lame duck gets frowned on like it does and that's really not the case, especially of late with term limits." Cherry contended lame duck can be both good and bad. "The truth lies in between all of that. It is an opportunity because the election politics are out of the way. That means certain things that weren't possible before lame duck all of the sudden are possible. The reason the politics aren't as constrained is because the politician doesn't feel that the voter has as much control over the situation any more. And the voter is saying, `this is the most dangerous time because they aren't listening to me right now,'" Cherry explained. Regardless of whether Dems win a chamber or the governor's office, none of these former lawmakers anticipate a big push from the governor himself to wrap up his agenda. He's had eight years of Republican control in both House and Senate, so he has accomplished most of what he wanted to do, they contended. "If he thought it was something that needed to get done, he went at it and got it done," Johnson said. "He really was never one to wait. He doesn't and never has worried about the politics of any issue. If the Governor thought it was something that needed to be done, he just went out and said let's get this done."